Free radicals – What do they do? Note: This is the 2nd part of a 7 article series on reducing your cancer risk. Goals for this article: To give you information on Free Radicals – What do they do? What can free radical damage cause? Name free radical generators. Free radicals have an unstable bond or unpaired electrons in their outer shell. They are unstable because their outermost shell is not full of electrons. Thus, they want to gain (or lose or share) electrons to become full of electrons in its outermost shell, also known as stable. These free radicals tend to attach the nearest molecule to steal an electron (-). Then that recently stable molecule, who now just lost an electron, is now also an unstable free radical. Then that free radical will look for a nearby molecule to steal an electron to become more stable. Now a chain reaction has occurred. It’s important to stop the free radicals because they will cause more free radicals, or unstable molecules. Free radicals cause oxidative stress/damage to cells & DNA which causes mutations. These mutations may create disease i.e. cancers, CVD, alzheimer’s, parkinson’s, diabetes, rheumatoid…. 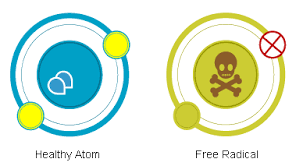 Free radical generators include, but definitely not limited to, pollution, radiation, smoke i.e. tobacco, pesticides, insecticides, sun, alcohol, asbestos…Free radicals accumulate with age. Thus, it’s important to become proactive NOW! This is especially important if you have cancer in your family. It’s very interesting. Sometimes you talk to people and they tell you about how they are feeling. During these type of conversations, after so much reading I’ve done in the past 2 years, I wonder if the symptoms they are experiencing may be avoidable. One reason is because of what I went through and what I learned. After more than 20 years of experiencing pain in my back and my right side, I found that my symptoms were caused by a food sensitivity to gluten or wheat, and not a disease process (thankfully). Here’s my story. Since the 80’s I had upper back pain. I attributed it to a car accident I had, stress, a pulled muscle, etc. I would go to the chiropractor here and there, especially when it got bad. I would go to the gym and exercise. I would go to yoga. We bought a new mattress. Nothing helped. Additionally, I would have terrible pain on my right side. It would come and go, but sometimes was really bad. My husband would worry. We talked about it many times and thought, perhaps, it was gallbladder, diverticulitis, who knows? I went for sonogram after sonogram over the years. I went for blood tests thinking it was ovarian cancer. Both pains were sharp, stabbing pains. I would sometimes wake up in the middle of the night because of the pain. Then, by chance, I happened to watch a physician on a television news program describe wheat sensitivity. I hurriedly purchased a book about gluten allergies. I read about the symptoms of wheat sensitivity and stopped eating flour, rye, barley and malt just to try it. They said it would take 2 weeks to “detox”, and, guess what? After over 20 years, I felt better. The pain was gone. Amazing. I did get tested for celiac disease, but did not test positive. That was o.k., as a food sensitivity can cause so many problems. I learned a lesson. I didn’t “dig” enough to find a root cause for my problem. I just kept trying to treat the symptoms. My husband has a friend who had begun experiencing symptoms of diabetes. Interestingly enough, he went to a doctor who began treating him for diabetes and prescribed many different medications. He, however, questioned WHY he was all of a sudden experiencing diabetic symptoms without having any risk factors for having diabetes — he did not have a family history, was not overweight, ate healthy foods, and was very active. Because he questioned the clinician and went to a few others with the determination to find out what was causing his symptoms, he found that he had a condition where his blood sugar would rise if he DIDN’T EAT. If he wasn’t persistent in finding out what was causing his symptoms, he would have just accepted the medications the first doctor tried to give him. He was smart. He was persistent. He was in control of directing his care. Almost 2 years ago I heard about a book and read the Perfect 10 Diet written by Michael Aziz, MD. The book has given me untold insight and started me on a path of discovery regarding root causes for disease processes and what you can do to prevent or reverse conditions. Ask. Question. Pursue. It’s your body. It’s your health. It’s your quality of life. Check out our new blog, http://timetoplay.com/blog/, where we are looking for and posting health news you should know on a daily basis. Some of this stuff is mind-blowing. And, don’t forget to check out www.timetoplay.com. Our professional resources will help you create a better life. Enjoy Life and take Time to Play!